6-foot-3, 220 pound defenseman is a veteran of 12 NHL seasons and has 64 goals, 144 assists and 208 points for his career. 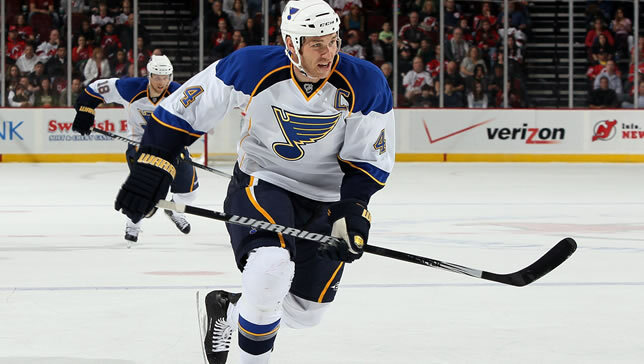 The Tampa Bay Lightning have acquired defenseman Eric Brewer from the St. Louis Blues in exchange for defenseman Brock Beukeboom and a third-round pick at the 2011 NHL Entry Draft, vice president and general manager Steve Yzerman announced today. Brewer, 6-foot-3, 220 pounds, is a veteran of 12 NHL seasons, appearing in a total of 736 games with the Blues, Edmonton Oilers and New York Islanders. He has amassed 64 goals, 144 assists and 208 points for his career. Brewer has also skated in 12 career Stanley Cup Playoff games, all with the Oilers, registering two goals and 10 points. He has reached double digits in points in eight of the last 10 seasons. A native of Vernon, British Columbia, Brewer served as captain of the Blues since the 2007-08 season. In 54 games played this season with St. Louis, he tied a career-high with eight goals, ranking first among team defensemen, and also recorded 14 points. He led the team in average ice time per game with 22:14. Brewer has also excelled on the international stage, representing Team Canada in multiple tournaments. He won his third gold medal at the 2007 World Championships after also earning the competition’s top prize in consecutive years at the 2003 and 2004 tournaments, respectively, and captured gold at the 2004 World Cup of Hockey. Brewer also served an integral role in Team Canada’s run to the gold medal at the 2002 Winter Olympics in Salt Lake City, notching a pair of goals, including one game-winner, in six games played. Brewer was originally selected by the Islanders in the first round, fifth overall, at the 1997 NHL Entry Draft.